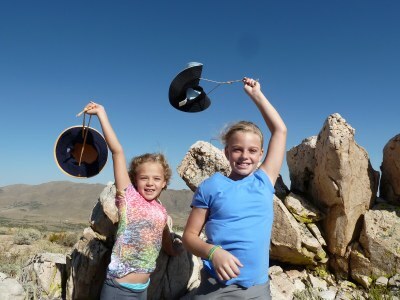 The author's daughters, Caroline and Hannah, in Nevada. A 1667 image of the shark head examined by Italian geologist, Nicholas Steno. The next morning the girls sorted through a bag of seashells and sharks’ teeth we had gathered several years earlier on a trip to the Everglades. They selected a few tiger and lemon shark teeth, some sand dollars, and several cat’s claw shells, which they put into their daypacks along with sun hats, binocs, water, and enough licorice to allow us to survive the apocalypse. After eating a big breakfast of scrambled eggs, provided courtesy of what Caroline calls our “homemade chickens,” we took Beauregard the dog and headed up the brushy slopes of Moonrise. It was a typical late summer afternoon in the foothills of the western Great Basin Desert, which is to say that the Washoe Zephyr was blasting out of the canyons at about 40 miles per hour, making it necessary for us to yell in order to be heard over the big wind. After hiking into the headwind for 45 minutes, we paused on the dusty slope of the mountain to drink some of the well water we had slogged up the hill. Like any enterprising almost-seven-year-old kid, Caroline had over packed her daypack and then decided that I should haul it up the mountain along with my own. Just as I was offloading both packs to pause for water, an especially strong gust lifted a cloud of sand and debris from the flank of the mountain and blasted it into my face. It felt as if a dump trailer of three-quarter-inch drain rock had been emptied into my left eye. No amount of blinking and dousing it with water seemed to help, and eventually I decided that we would continue our mission despite the fact that I was now half blind. Caroline suggested helpfully that if my eye didn’t heal I could wear a permanent eye patch, which would be “really piratical and totally epic.” Suddenly I noticed that Beauregard the dog was nowhere to be seen. It was common for Beau to flush and chase quail and jackrabbits, but this time he had not circled back, instead simply vanishing into the howling desert. We hollered for him, but the Zephyr was so strong that our calls barely penetrated the wall of wind, never mind crossing the expansive desert beyond it. And while the blind Dad and lost dog misadventure was under way, the ocean of blooming rabbitbrush in which we stood had also caused us all to begin sneezing and sniffling. 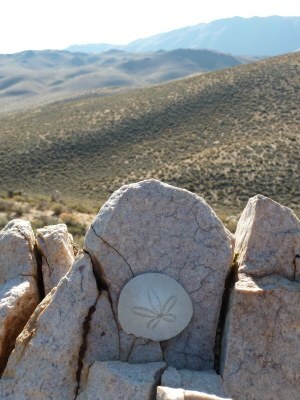 Sand dollar placed near Moonrise peak. Photo by Michael Branch. We now resumed our ascent, though by this point I had tied a bandana over my eye as a makeshift patch and was as a result off balance and staggering. I was hoarse from screaming for my lost dog, and I had no water to drink because I had poured the last of it over my face in a failed attempt to dislodge the boulder from my eyeball. I was also sneezing and wiping snot off my face with my sleeve—mucus which I then accidentally transferred to my good eye, which was now so red and itchy from wind, rabbitbrush, and snot as to no longer qualify as good. 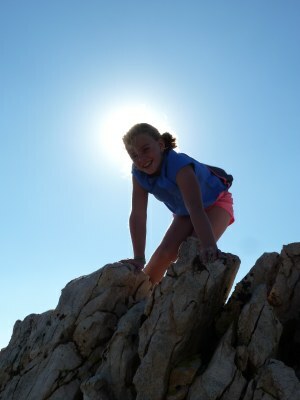 At last we reached the summit ridge of Moonrise, where I flopped down in the lee of a granite palisade to gather myself while the girls did some climbing in the rocks. “Watch for rattlers, and don’t put your fingers anyplace where a scorpion would hang out,” I called. “We know, Dad,” said Hannah, as the sisters picked their way up into the cliff. After a half hour they clambered back down, announcing that they had discovered not a single seashell or shark’s tooth. For my part I was thirsty, tired, snotty, sneezing, worried about my dog, and much in need of the “three cold beer treatment” for my injured eye: apply one to wound, drink two, repeat as necessary. I declared that it was time for us to leave our own seashells on the mountaintop. The girls unpacked their sand dollars, cat’s claws, and sharks’ teeth, and located perfect notches in the granite, where they placed these treasures as carefully as if they were religious icons being set gently into the niches of a temple wall. After I had snapped a battery of pictures to commemorate the event, we turned our backs to the wind and headed for home. The author's daughter near Moonrise peak. Photo by Michael Branch.